And get on another one. The fact that we're going to have more Star Wars films is great news. For fans, and for the series itself. But since Lucasfilm owns Indiana Jones I wish to now get Disney to make more adventures of the Man in the Hat. No, I'm not talking about a new film. I'm talking about that animated series that Paul Dini wants to make. And yes, I know, I've mentioned it before. But now that Disney owns Luke and Leia, it's time to move on to a new obsession. It's not just me, artist Patrick Schoenmaker, he's the one that did the incredible art that I used for this post has been animating a short to show Lucasfilm that it should go ahead with an animated series. He's doing it on his own dime and his own time. Now if he can just get together with Dini, go in and pitch it to Kathleen Kennedy as a great thing for Disney XD or ABC Saturday morning then I'll be a very happy man. Hey, how many people six months ago were getting tired of me talking about the virtues of Disney owning Lucasfilm because it was never going to happen? Exactly. I'd even settle for a CG series if they did it using these type of models, but I'd prefer good ole' fashioned hand drawn. 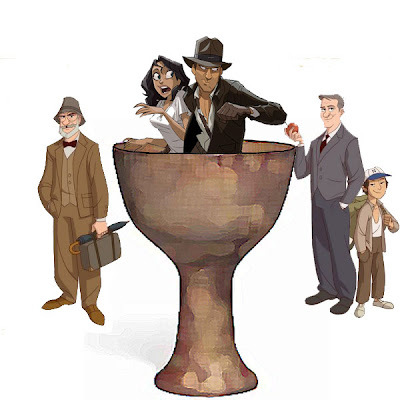 Imagine each week turning in to see Henry Jones Jr. on another adventure, trying to escape the clutches of death and watching each week as he cheats death, and searches for fortune and glory. Maybe that's the way we get Iger, Horn and Kennedy to sign off on it? I think Paramount has a distribution deal for Indy on all things film and TV. Until this changes, Disney will probably put this franchise on the back burner. From what I've heard, the distribution deal is for film. So we theatrical only. Therefore Disney has the ability to make TV shows that don't interfere with their contract with Paramount.